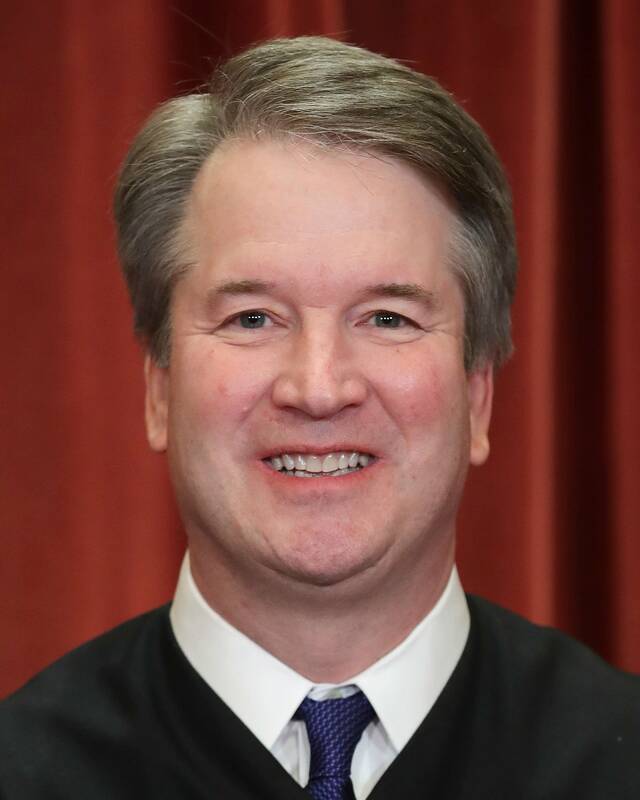 Court observers view Kavanaugh and Chief Justice John Roberts as possible swing votes in the case, which is the subject of Season 2 of APM Reports' investigative podcast In the Dark. While Roberts' questions didn't provide much hint of which way he was leaning, Kavanaugh's queries did. "Part of Batson was about [the] confidence of the community and the fairness of the criminal justice system. ... And that was against a backdrop of a lot of decades of all-white juries convicting black defendants," Kavanaugh said. "It's easy to be skeptical about Batson, and he didn't seem to be," Garrett Epps, who teaches constitutional law at the University of Baltimore, said of Kavanaugh. "What was striking to me was that he was always going one way. He was not playing devil's advocate." In perhaps the most telling exchange of the morning, Kavanaugh followed up with a question for Mississippi Assistant Attorney General Jason Davis, there to defend Evans' handling of the trial. "Can you say, as you sit here today [that] you have confidence in how this all transpired in this case?" "I have confidence in the strikes that this district attorney made based on the four corners of this record," Davis replied, presumably referring to the transcript of Flowers' sixth trial alone. But Flowers' lawyers have asked the court to look beyond the "four corners" of that transcript when judging whether Evans discriminated. And the high court has repeatedly agreed with that precedent in several rulings that expanded defendants' protections in the decades following Batson. On both legal principle and on the extraordinary facts of the Curtis Flowers case, the state of Mississippi appeared to be fighting a losing battle. 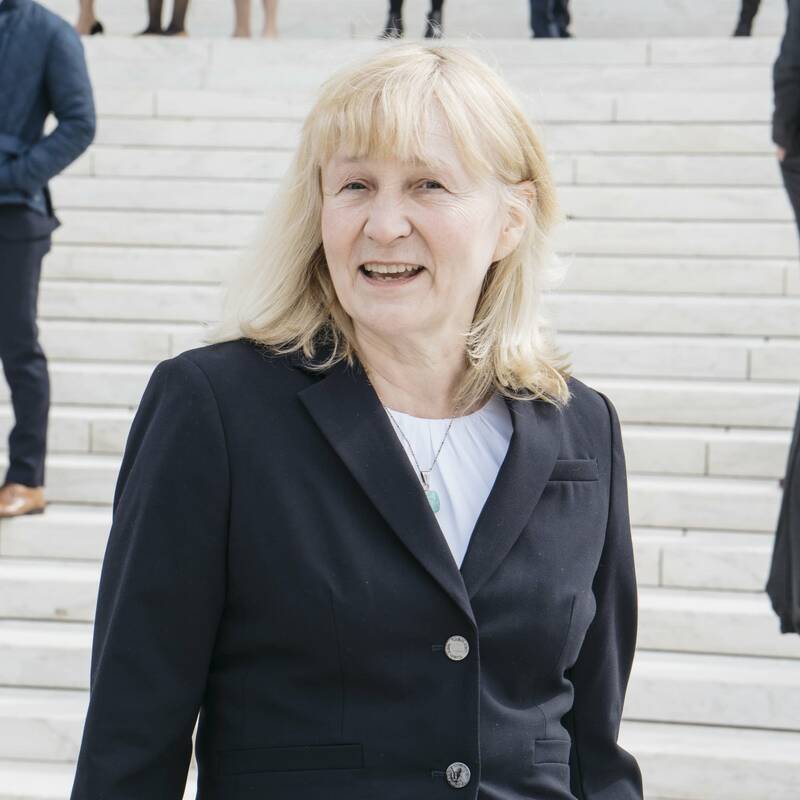 Flowers' lawyer, Sheri Johnson of Cornell University's Death Penalty Project, pointed to Evans' history of using the overwhelming number of his strikes in Flowers' six trials against African-Americans. Sixty-one of the 72 jurors in those six trials were white, and none of the four juries that convicted Flowers had more than one African-American. Montgomery County, where the murders took place, is roughly 45 percent black. "The numbers alone are striking," Johnson told the court. "But the numbers do not stand alone." Johnson reminded the justices that lower courts have twice found that Evans violated the Batson standard in Flowers' previous trials. Whether Evans did so a third time, in 2010, hinges on the validity of the race-neutral reasons he gave at trial for striking five black jurors. Justice Samuel Alito interrupted Johnson first, seeming to reaffirm her statements. "The history of this case is very troubling. It is cause for concern," Alito said. But later, he pressed Johnson on which juror removal appeared to be most motivated by race, asking, "What's your strongest strike?" Johnson pointed to the elimination of Carolyn Wright who Evans said he'd struck, in part, because she worked at a Wal-Mart where Archie Flowers, Curtis' father, also was an employee. But during jury selection, Carolyn Wright had said that, though she worked with Archie, she didn't really interact with him. Several justices seemed to agree that Evans' strike of Wright was dubious. "In many respects ... Ms. Wright is a perfect juror for a prosecutor. Right? She strongly favors the death penalty. Her uncle is a prison security guard. Her relative is the victim of a violent crime," Justice Elena Kagan said. "Except for her race, you would think that this is a juror that a prosecutor would love when she walks in the door." Johnson pointed out that Evans had questioned Wright more than a similar white prospective juror who he accepted with little scrutiny. She said that this type of disparate examination was part of a broader pattern of Evans', that the prosecutor questioned many black prospective jurors more rigorously than white ones during jury selection in order to dredge up reasons for striking them. Kagan agreed, saying, "It looks as though [Evans] is designing, trying to create a record for striking black jurors." She called the large disparity between the number of questions that Evans asked black jurors and white ones "staggering." An APM Reports analysis recently showed that the prosecutor asked black prospective jurors on average three times more questions. 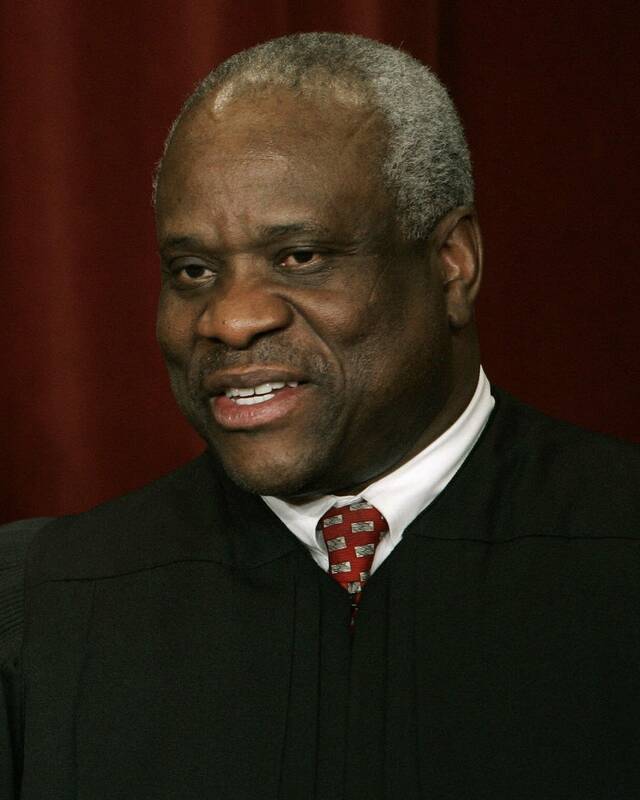 In a stunning departure from three years of silence on the bench, Justice Clarence Thomas squeezed in a single question for Johnson, about the race of the jurors whom the defense struck. Johnson replied that they were all white, but Justice Sotomayor jumped in to point out that the fact is irrelevant because the defense only had one opportunity to strike a black juror; Evans had already struck the others. Thomas is likely the staunchest vote against Flowers, having dissented on Batson cases over the decades. "I think we have a very strong case," Johnson said after the hearing. "I'm not going to predict what they'll decide. I think they were receptive, and I hope that they will decide that the Mississippi Supreme Court was clearly erroneous in its findings." Davis, the lawyer for the state, refused to comment to the press. Even he conceded at the beginning of his presentation that the history of the case was "troubling." But he tried to direct attention away from Evans' pattern across the six trials and toward the record from the 2010 jury selection alone. "If we disengage this troubling history ... we don't have any taints," Davis said. But Kavanaugh fired back, "We can't take the history out of the case. ... It was 42 potential African-Americans and 41 are stricken, right?" Davis continued to face tough scrutiny from the more conservative side of the bench. Chief Justice John Roberts appeared to corner Davis, by asking, "Is there anything in our precedent that suggests that there ought to be a limitation on looking to the history of the prosecutor involved?" "There's no limitation on the history. I think certainly the precedent says that you have to consider it," was Davis' response. This seemed to undercut his argument. Justice Neil Gorsuch gave Davis a chance to resuscitate his case by asking, "What rule would you lay down?" 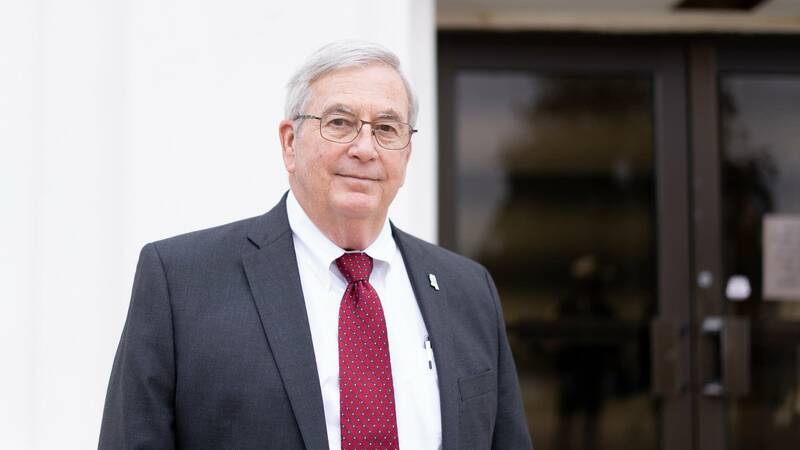 The question offered Davis an opportunity to propose a new precedent to the court, presumably one that would limit consideration of a prosecutor's history and allow the state of Mississippi's argument to prevail. But Davis had no good answer. "I think [history] certainly has to be looked at," he offered flatly. Stephen Bright, a Yale Law School professor who's successfully argued two Batson-related cases before the court, identified this exchange with Roberts and Gorsuch as a key moment. "The state's position had to be that the history was limited in some way," Bright said. "There was no good answer for the state to these questions, but the questions and answers reinforced how much the history of this case sets it apart from any other case and compels a decision in favor of Flowers." At several points, the justices seemed shocked that the Mississippi Attorney General's office hadn't intervened in the case earlier. Alito asked, isn't it "enough already?" Davis countered that the Attorney General could only have stepped in at Evans' request. Alito wouldn't let it go. A few minutes later, he asked again, "Well, could we say in — in this case because of the unusual and really disturbing history, this case just could not have been tried this sixth time by the same prosecutor?" In his answer, Davis refused to defend Evans. "Hindsight is 20/20. I was not involved in any consideration on that. Had I been, it might have been a suggestion of mine that that be the case." Justice Stephen Breyer led Davis point-by-point through the similarities between Carolyn Wright and a white juror, Pamela Chesteen, who also knew Archie Flowers from her job, but was seated on the jury. Breyer asked why Wright was struck while Chesteen wasn't. "It felt a little bit like Justice Breyer eviscerated him," said Chris Kemmitt, a lawyer with the NAACP Legal Defense Fund, who wrote a friend-of-the-court brief in support of Flowers. "If you can't answer that question, you lose, because all that Mr. Flowers needed to do is say one strike was discriminatory. If the court finds that one strike's clearly discriminatory, he gets a new trial. And Breyer just said, 'Here's the strike.'" Throughout his arguments, Davis resorted often to the refrain that, in spite of Evans' history in Flowers' first five trials, his strikes in the sixth were all constitutional. "The district attorney offered valid race-neutral reasons," Davis said. "The strikes in this case are supported in the record." But he struggled to account for Evans' history with striking black jurors in the Flowers case, an issue the justices hammered him on repeatedly. Kavanaugh noted that the Batson decision explicitly states that striking jurors because they're the same race as the defendant — under the assumption that a black juror will always vote to acquit a black defendant — is a damaging stereotype and unconstitutional. "That was really the critical sentence in Batson," Kavanaugh said. "You can't just assume that someone's going to be favorable to someone because they share the same race." Kavanaugh then noted, once again, that Evans had struck 41 of 42 African-Americans that had come before him in the Flowers trials and followed with a devastating question, "How do you look at that and not come away with thinking what was going on there was what ... the majority [in Batson] said was not permissible?" Davis responded that Evans didn't make any predetermined plan to strike black prospective jurors. But Kagan shot back, "I guess I don't understand how you can say this." After Davis' 30 minutes were up, Flowers' lawyer, Johnson, had four minutes available for a rebuttal. She waived them. Flowers needs at least five votes to win a reversal of his conviction. Four would most likely come from the more liberal block of justices who tend to rule in favor of defendant's rights — Kagan, Ruth Bader Ginsburg, Sonia Sotomayor and Breyer. The fifth would have to be delivered by a Republican-appointee, perhaps Roberts, who in several recent rulings has been willing to split from the right, especially in matters of racial bias in criminal cases. After his comments Wednesday, it's easy to imagine Kavanaugh providing the swing vote too. Flowers didn't attend the arguments. He remained in his death row cell at Mississippi's Parchman prison. 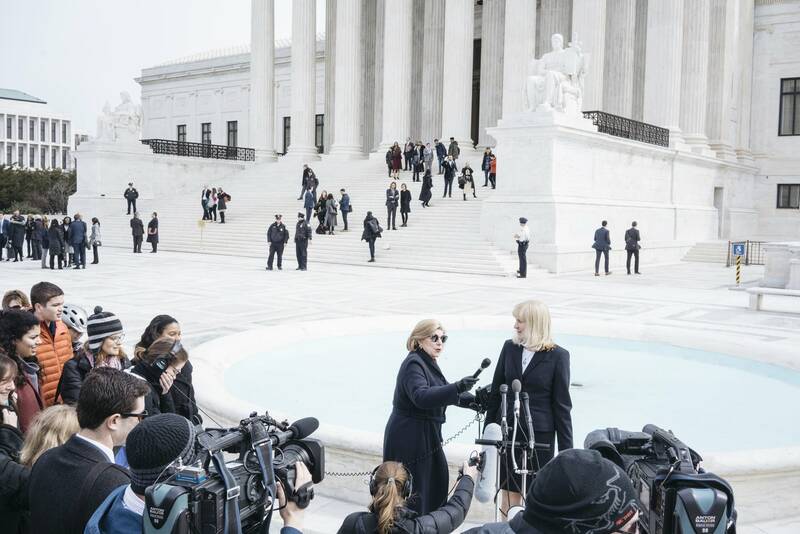 But more than 400 people — Winonans, law students, and podcast fans, some lining up as early as 3 a.m. on the marble steps of the Supreme Court — tried to attend the oral argument. They came from as far as Texas, California and France. 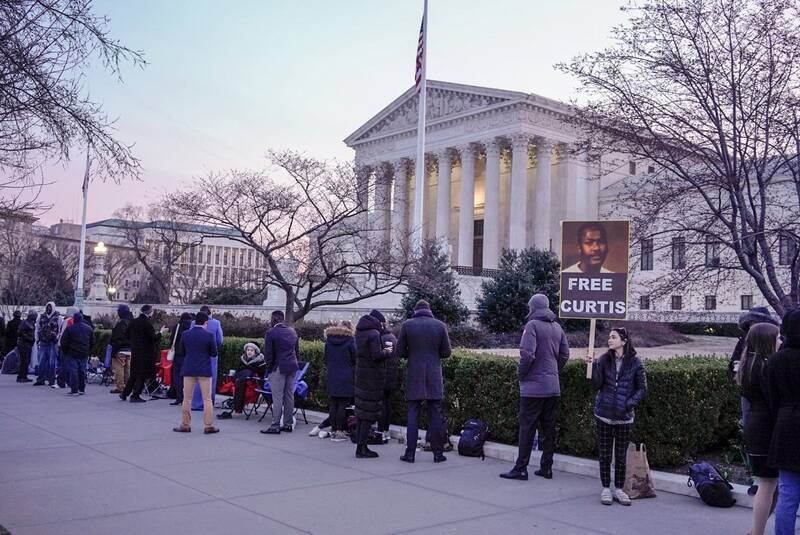 Several held signs that read, "Free Curtis." Freedom remains yet another hurdle for Flowers, though his lawyers did appear to win the day. Should the Supreme Court overturn his conviction — ruling that Evans violated his constitutional rights — the decision of what happens next will be made by Evans himself. The district attorney, who is 66 years old, is running unopposed for re-election in November. 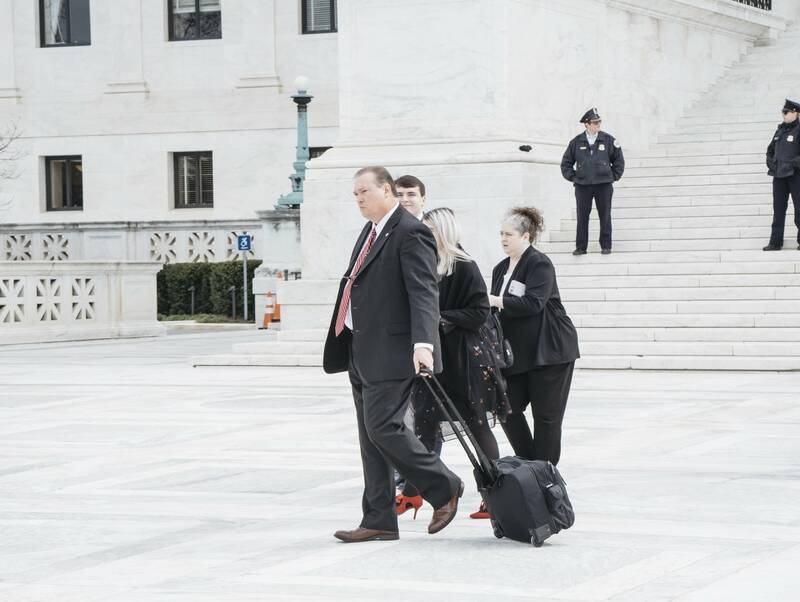 Evans wasn't inside the Supreme Court during arguments or seen outside, and nobody answered the phone at his Mississippi office in the afternoon. He recently told reporters from In the Dark that he doesn't think Flowers' conviction will be reversed. If it is, Evans said, he'd be open to trying Flowers a seventh time. "That case has been just as strong from the beginning as it is now," Evans said in January. "There are no problems with the case."